At the Law Offices of Thomas More Holland, we understand that being injured in an auto accident is very stressful. In addition to being injured, you have to deal with insurance companies to make sure that you receive all of the benefits you are entitled to, including medical expenses and wage losses, and you cannot even be sure that the insurance company is on your side. That is why if you, a family member or friend was injured in a car, truck, bus or motorcycle accident, you need a lawyer who understands the law, will fight aggressively for you, will keep you informed, and will make sure you get all the benefits and the largest award you deserve. That lawyer is Attorney Thomas More Holland. At the Law Offices of Thomas More Holland, we do everything we can so that our clients who are injured in car accidents receive all of compensation and benefits they deserve. Yes. 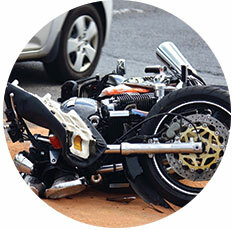 Car accidents cases can be complicated, and the insurance companies have lawyers who work for them. You need an attorney who understands auto laws, who will work aggressively for you, and has handled these cases. Attorney Thomas More Holland has represented car, bus, truck, motorcycle and other vehicle accident victims for more than 20 years, and the attorneys and staff of the Law Offices of Thomas More Holland have the knowledge to handle your case. You should consult an attorney as soon as possible. At the Law Offices of Thomas More Holland, we believe that one of the most important services we provide is explaining the law to our clients. Too often, insurance companies do not provide complete or accurate information. It is important to have someone who works for you and who will explain your rights. When you call the Law Offices of Thomas More Holland, you will receive personal attention from our attorneys and well-trained support staff, as well as the professionalism you deserve. At the Law Offices of Thomas More Holland, we will fight to protect your rights and the rights of your family and friends. If you believe you have an auto accident claim, contact the Law Offices of Thomas More Holland by filling out a simple form, by sending an email or by calling (215) 592-8080.